Hugely scalable - ContentIndex+ will cope easily as content grows. Facilities for video, audio and a range of other digital assets. ContentIndex+ is a versatile and robust Content Management System. It handles a variety of digital assets - including text, images and multimedia - and supports publication to websites, kiosks, mobile devices and publications. It delivers consistency of presentation through flexible template structures and Cascading Style Sheets. Two excellent examples of what can be achieved with ContentIndex+ are the Museums Association and Everton Collection websites. ContentIndex+ facilitates multi-users access, has powerful cataloguing, structured search and sophisticated terminology features. It incorporates tools to support efficient work processes and provides flexible access and delivery systems. The system encourages efficiency, encouraging the use and re-use of existing material. Templates provide structure allow the stored content and multimedia to presented in many different ways. There is a user-friendly interface for editing with output through templates into a variety of browsers. Modifications to content can be viewed instantly on the web. Linking to other URLs is easily enabled from within the page authoring system. There are tools to supplement the text generation capability, assisting with the writing and editing of narratives or themes. The Siteman module manages publication to the web and holds multiple versions of the web site and its databases - e.g. older, localised and child friendly versions. It facilitates rapid switching back to earlier versions of the site. System Simulation's broader experience with image and digital asset management systems informs the asset handling capabilities of ContentIndex+ and functionality from those products can be incorporated. 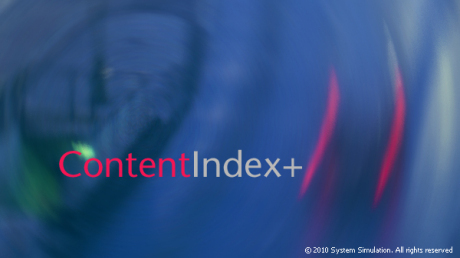 Further information on ContentIndex+ is available here.